Scientists Reveal Why Baby Laughter Is the Best! Auntie, Why Do I Have to Go Back to School? New research shows that playful boys are viewed as rebellious and disruptive by their 1st, 2nd, and 3rd grade teachers whereas playful girls are not. As a result of observing teachers' attempts to discourage the expression of playfulness, the boys' classmates changed their view of these "class clowns" from initially positive to increasingly negative. The playful boys also developed more negative perceptions of themselves over time. The study, published in Frontiers in Psychology, indicates that teachers' negative perceptions of playful boys in their early school years may forebode a longer-term negative trajectory for the boys as they continue through their formal school years. 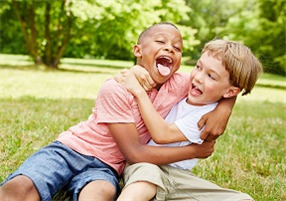 "Children regularly observe playful boys, or 'class clowns', being treated negatively by their teachers, and over time come to change their view of them as desirable playmates in 1st and 2nd grades to being seen as boys who should be avoided or spurned in 3rd grade," says author Dr. Lynn A. Barnett, Associate Professor at the Department of Recreation, Sport & Tourism University of Illinois at Urbana-Champaign, USA. Dr. Barnett followed 278 kindergarten-aged children over the following 3 school years to investigate children's, classmates' and teachers' views on playfulness. At the end of each academic year, the children were rated by teachers, peers and themselves for perceptions of their level of playfulness, disruptive behavior, social competence, social status and class clown status. The results confirmed dominant gender differences found by previous research in the field. Whereas teachers regarded playful boys as distinct from less playful boys, no such discrepancy was detected for girls. This manifested as playful boys being negatively regarded as rebellious, intrusive and having poor social skills, and being labeled as "class clowns" by their teachers. In contrast, the girls' playfulness levels were not a consideration in ratings by teachers or peers. The teachers' disapproving view of playful boys was in contrast to the children's self-perception and how they were regarded by their peers -- who at the outset viewed playful boys as appealing and desired playmates. The data revealed that the playful boys were stigmatized by their teachers, which was communicated through verbal and non-verbal reprimands. The other children in the class picked up on this message, which had a direct impact on their perception as "class clowns." "Teachers view class clowns as problematic and strive to stifle or extinguish their playfulness," says Dr. Barnett, who argues that these negative perceptions were likely transferred to the playful boys and their peers. She believes the findings are telling on the way in which the classroom setting affects children. "My research in the field of educational psychology, and years of studying how and what children learn in school, has taught me that most of the important 'life lessons' take place outside the structured adult-directed classroom setting, and much more frequently during children's own free play alone and with each other," she notes. "Over many years of studying children at play, I have witnessed an alarming increase in play being structured and directed by adults -- and what was once free play out-of-school time being usurped for extracurricular activities and lessons, tutoring, homework, and the like." "The way that our society views and treats children and childhood has undergone massive changes," she continues. "There is much being written about the trends in extending schooling down to increasingly younger ages, and research that shows that expectations for kindergarten today are what was in place for later primary grades previously." "The decreases in individual expression and creativity, and social and emotional skills, and the increases in bullying, childhood obesity, and mental health issues such as stress, depression, anxiety are all cogent signals that we need to restore and extend children's free play time. All the projections are for this negative trajectory to continue if we don't change its course and effect major changes," concludes Dr. Barnett. She would like to see future research focus in more detail on the children's and teachers' actual interactions in the classroom, to determine the basis of teachers' perception of playful boys as disruptive and to further investigate the effect of this phenomenon on children's behavior and welfare. Frontiers. "Class clowns: Playful boys viewed more negatively than playful girls, study finds: Study confirms gender differences in how teachers perceive playfulness -- and provides insights into the potentially damaging effects of discouraging playful behavior in the classroom." ScienceDaily. ScienceDaily, 5 April 2018.